The Small Things is a Precious Moments Blogger & received product in return for a feature on this blog. This post may contain affiliate links. All opinions are my own. As some of you know, I am a Precious Moments blogger. I receive the cutest products and I get to introduce them to you. It began more than three decades ago, when Precious Moments creator, Sam Butcher, began drawing the endearing teardrop-eyed children he called "Precious Moments," as gifts for family and friends. Today, his Precious Moments artwork is among the most recognized art in the world, sharing messages of loving, caring and sharing with collectors from around the globe. When you see "the eyes", you will know that it is a Precious Moments product for sure! The "True Beauty Is Reflected From The Heart" figurine is adorable. Beauty is found in confidence, compassion, determination, and so many other aspects that lie far deeper than the skin. I love how her reflection shows in the mirror and every detail that goes into this product. 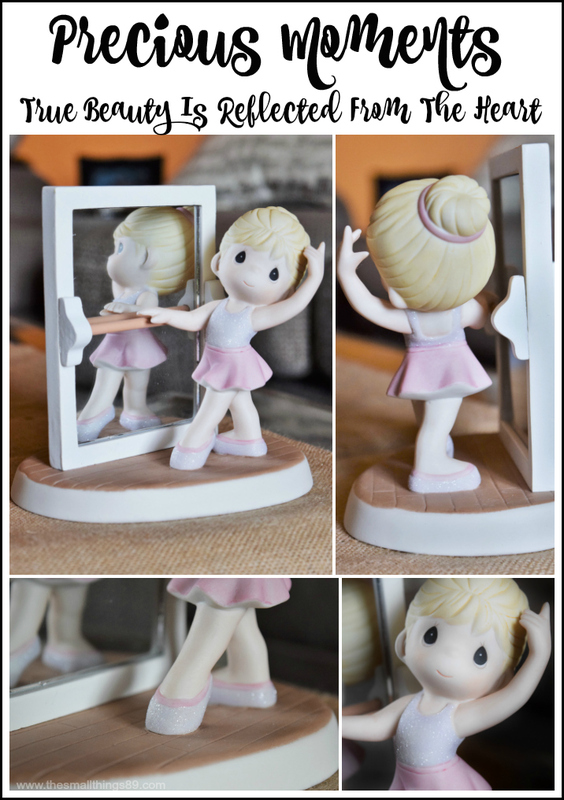 The "True Beauty Is Reflected From The Heart" figurine is made of Porcelain/resin/glass and it stands 5 1/4" H. As this diligent dancer practices her ballet positions at her barre, her beauty is not only reflected in the mirror, but from her heart as well. The details that go into painting these products always amazes me. I love the hints of pink and glitter on this one. As you can see, it is flawless and adorable. The cute wood floor that she is standing on is the perfect touch. I love her blonde hair as well because my daughter is a blonde. This product means so much to me because I always tell my daughter that no matter how pretty you are on the outside, it is what is in the heart that matters. That is what this product represents to me. This product is available on the Precious Moments website for only $55.99. You can purchase today! Win it: One reader is going to win their own "True Beauty Is Reflected From The Heart" Precious Moments figurine. Reader must reside in the USA or Canada. Giveaway is open for two weeks, and ends on September 1st. Please read the first question on the form, and answer correctly. Answers such as " I want to win", will be deleted. All mandatory entries must be completed and they will be verified. Cheating in any way will result in being banned. Enter below. Goodluck. True beauty is what We see in others especially this week in Louisiana, seeing families pull together, helping each other during trying times after a horrific flood. Kids seeing the kindness in others is true beauty. Blood is thicker than water...always show love to your siblings, even if they're annoying you at the moment. I teach my kids to include others when playing at school even if there are some personality conflicts. I try to teach my kids that a unkind word once spoken can never be unsaid. We teach them the golden rule...treat others the way you want to be treated. I always teach myself, my son, and nieces that we should never look down on anybody unless we are trying to help them up. Treat others as you would want to be treated is the big one in out home. Thanks so much for the chance!